This straggly, creeping plant has few flowers, which is a pity because they are rather attractive. 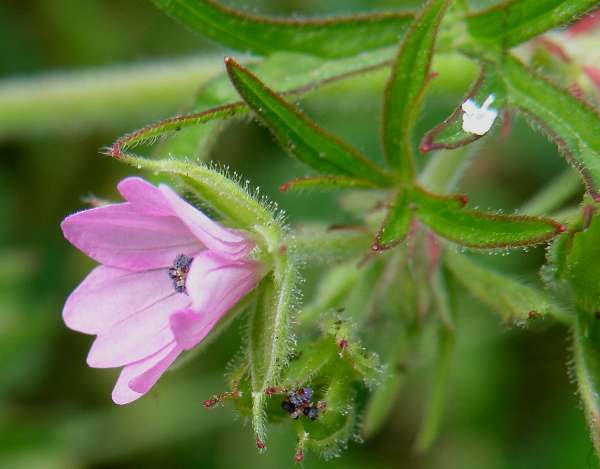 A hairy annual plant growing to about 60cm, although 30 to 40cm is more typical, the leaves of Cut-leaved Cranesbill are deeply divided - almost to the base. Its hermaphrodite mauve flowers, 12 to 18mm across and with five slightly notched petals, are borne on very short stalks, while the sepals of the flowers are densely hairy. Fruits (seeds) ripen in beaked pods formed from five fused sections of the ovary with an elongated column that together looks like the head and beak of a stork. When fully ripened the seed pods open in curls from the base to expose the seeds. 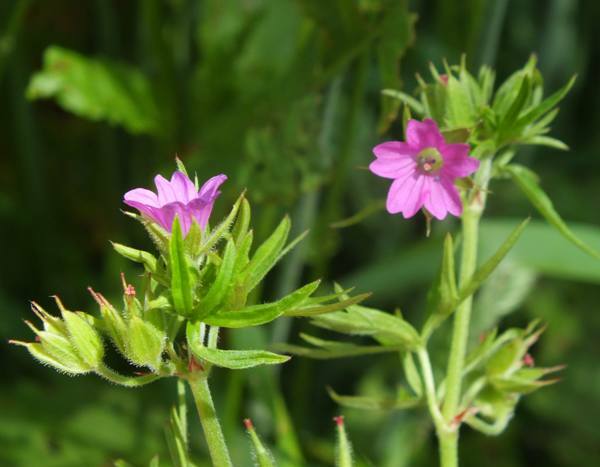 Cut-leaved Cranesbill is common throughout Britain except for the far north of Scotland; it is common and widespread in Ireland and in most temperate parts of mainland Europe and Asia. In other parts of the world Geranium dissectum is an introduced alien species. 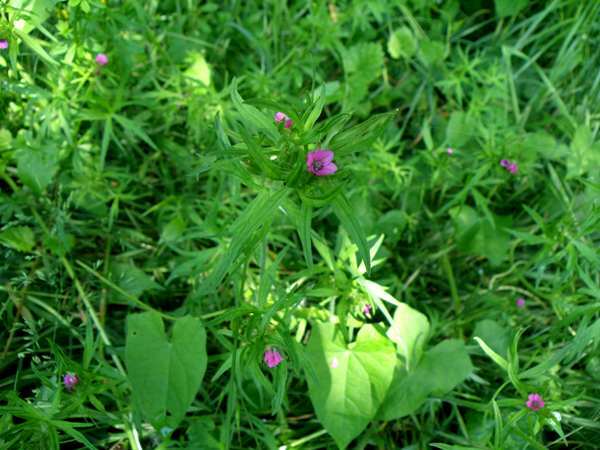 Rarely found in rich pastures, this plant seems to preferthinly grassed areas where the soil is recently disturbed soil - farm gateways, for example. Other places where this sparse-flowering wild geranium occurs include hedge banks, field margins and various kinds of waste land.. In Britain and Ireland Cut-leaved Cranesbill can be seen in bloom between early May and the end of August. This tannin-rich plant has many uses in herbal medicine. Infusions and extracts have been used to treat a range of ailments from diarrhoea to piles (haemorrhoids). A brown dye can be made from the dried flowers of Geranium dissectum. Geranium, the genus name, comes from the Greek noun geranos, meaning Crane (birds of the group of species known as the Gruidae). It is a reference to the beak-like fruit (seed capsule) which is reminiscent of the long beak of a Crane. Just as it sounds, the specific epithet dissectum means dissected, a reference to the deeply divided or cut leaves. Herb Robert Geranium robertianum has rather smaller and usually more abundant flowers. Bloody Cranesbill Geranium sanguineum produces bright red flowers. Wood Cranesbill Geranium sylvaticum is a northern species with small mauve flowers. The plants shown on this page were photographed at Goodwick Moor Nature Reserve, near Fishguard in West Wales during June.